Regurgitation of cud is a normal part of the digestive process in a cow. Cows belong to a group of animals known as ruminants, and have four distinct stomachs, including the rumen. The rumen is essentially a large fermentation vat where microbes "pre-digest" the food that the cow eats. When a cow is ruminating properly, she should chew her cud on a frequent basis. Just like a person who is ruminating over a thought, a cow who is ruminating and chewing her cud is processing her food over and over again. If a cow is violently regurgitating her cud, she has likely been exposed to a toxin and requires immediate veterinary attention. 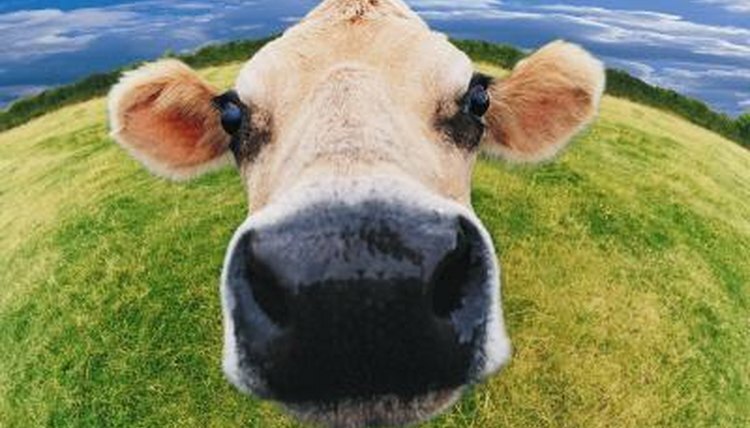 Cows have a highly specialized digestive system comprised of four separate "stomachs." After chewing and swallowing, the cow's food is passed into the first two compartments of her digestive tract, known as the rumen and reticulum. The rumen and reticulum are technically extensions of the esophagus in the cow. Food material mixes freely between the rumen and the reticulum and is regularly regurgitated back into the cow's mouth in the form of "cud" for her to chew on again and again. During this phase of digestion, microbes in the rumen are doing much of the work of digestion for the cow by fermenting indigestible plant material into substances that the cow can absorb directly into her bloodstream. After fully processing the indigestible components of the feed in the rumen, the digestible carbohydrates, proteins and fatty components of the diet are passed on to the next two compartments of the cow's digestive tract, the omasum and abomasum. Excess liquid is removed from the ingesta by the omasum and then digestion and absorption of nutrients proceeds in the abomasum and small intestine of the cow in much the same way that it occurs in simple stomached animals. The microbes of the rumen ferment the cellulose and other indigestible plant cell wall components of the feed into volatile fatty acids that can then be absorbed by the cow across her rumen wall and into her bloodstream. This is the most important phase of digestion for the cow. Farmers are taught to "feed the bugs, not the cow" in order to maximize health and welfare of their cows and improve their milk production. The normal microbial flora of a cow's rumen contains a mix of bacteria and protozoa and the balance of these microorganisms is crucial to proper digestion for the cow. Chewing on cud, or the regurgitated rumen contents, is a very important indicator that rumination is happening properly for the cow and that she is happy and content. A cow who is sick, stressed or compromised will not chew her cud regularly. Any condition that harms the normal microbial flora of a cow's rumen can be deadly to the cow. Most commonly, the rumen is damaged by cows who consume feeds that are too high in carbohydrates. Carbohydrates are very delicious to cows, so they will overconsume them if given the chance. High levels of carbohydrates in the diet cause certain acid-producing bacteria to proliferate and outcompete more beneficial bacteria in the rumen. This is known as rumen acidosis and can happen suddenly, or slowly over a long period of time. Sudden rumen acidosis from carbohydrate overload is often fatal in cows. Chronic low-grade rumen acidosis will adversely impact the health of the cow, reduce her milk production and predispose her to a variety of other ailments like laminitis, displaced abomasum and chronic diarrhea. A specific plant toxin found in mountain laurel causes ruminants to become so ill that they violently regurgitate their rumen contents. This is a medical emergency and requires immediate attention from a veterinarian. It can be difficult to maintain a healthy rumen in dairy cows who produce a lot of milk, as higher carbohydrate levels in the diet are necessary to support increased milk production. Working closely with a veterinarian and nutritionist to balance the feed properly is key to maintaining the health of the rumen microbes while still supporting milk production. Store high carbohydrate feeds like grain and corn somewhere secure so a cow on the loose cannot gain access and overeat these carbohydrate-rich feeds. Check your pastures for toxic plants like mountain laurel, and do not give any medication to a cow without consulting a veterinarian first to be sure it is safe for the rumen microbes. Why Do Pygmy Goats Grind Their Teeth? What Organisms Help Cows Digest Food?